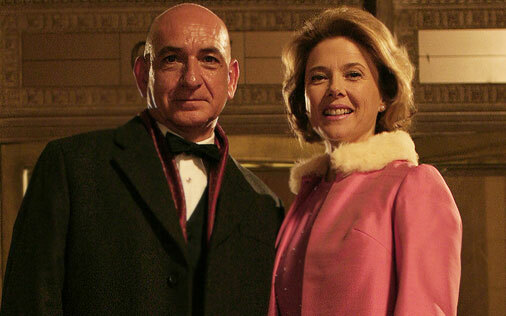 Mrs. Harris with Annette Bening and Ben Kingsley is based on the book by Shana Alexander (reviewed here). It is an HBO movie, which means it brings with it the attendant semi-salacious content and the cast of television regulars (Frank Whaley, Bill Smitrovich, Mary McDonnell, Michael Gross, Michael Paul Chan, Lisa Edelstein, and Ellen Burstyn making a guest appearance as one of Tarnower's "ex-es"). The overall approach is a tongue-in-cheek look at the woman-scorned motif from a feminist viewpoint. The script utilizes the multiple perspectives of Alexander's book. Alongside the Strictly Ballroom use of "interviews" interspliced with action sequences and awesome big band music, it captures the nouveau riche crassness of Tarnower's world, the world that seduced Harris against her better judgment. Kingsley and Bening do their usual respectable acting jobs. Kingsley conveys the necessary jerk charisma ("What a jerk! Eh, I guess I see why women were attracted to him.") 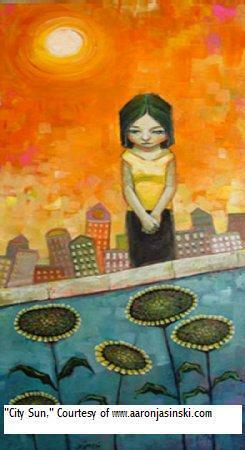 while Bening conveys Harris's complexity with an emphasis on her increasing mental and physical strain. The movie details Harris's self-destruction--she is a willing participant in her own debasement--but less her level of self-delusion. The television movie The People versus Jean Harris isn't really a movie. It's hard to say what it is. I'd like to say "docudrama," but it isn't even that. If anything, it comes across as a training video for lawyers. It is ONLY the trial with no flashbacks or recreations of evidence provided in testimony. The testimony is verbatim. Though pointless to watch, the television whatever-it-is is interesting to listen to. Since it is based on verbatim testimony, it provides insight into the problems of the case and backs up Alexander's and Trilling's analyses. Ellen Burstyn as Mrs. Harris does a magnificent job delivering Harris's quick wit as well as her feeling that the prosecution was "lying" (it wasn't) and taking things out of context (every lawyer does this). As Alexander points out in her book about Harris (building off a point made in her earlier book Anyone's Daughter about Patty Hearst), Harris came from a background that had no real experience or understanding of the adversarial system. In Harris's mind, she was supposed to be able to sit on the stand and explain things entirely within (her own) context, answering exactly those questions that would bring out the "truth" (according to her). She was utterly ill-prepared for Prosecutor Bolen's relentless questioning and his insistence that she provide yes/no answers. 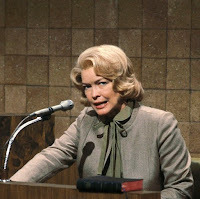 Burstyn's part of the movie-thing IS worth watching. Burstyn embodies Harris's dumb-smartness. Harris was a highly educated, exceptionally bright and intelligent woman (I appreciated that for the first time while listening to the transcripts) with a deep chasm of naivety between her and reality. Lots of smarts. Not a lot of common sense--or the ability to comprehend how thoroughly divisive viewpoints can prove (when people gave differing versions of events on the stand, she was convinced they were lying, not that they were humanly forgetful or humanly different from herself). She was worldly and sophisticated but with no attendant animal instincts. All head and heart, no peasant appreciation of the physical. She was ill-equipped to survive in a milieu where people did exactly what they wanted when they wanted with thoughtless mental and physical confidence. I was asleep. You never expect one of those wee-hours phone calls informing you that... that your good friend's just been shot dead. When Lynne hung up, I said to Viv "Well, if he's dead, why couldn't she have waited until morning?" That's a level of indulgent self-assuredness that Harris was simply incapable of matching. Jerry Orbach as lawyer before he became police. Both movies do a decent job trying to elucidate the story's protagonist (despite being the murderess), Jean Harris. Both, however, skimp on Harris's natural grievances regarding money. 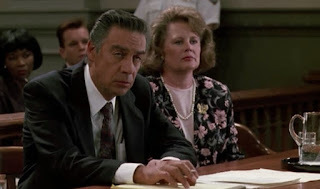 The Law & Order episode "The Wages of Love" provides that side. 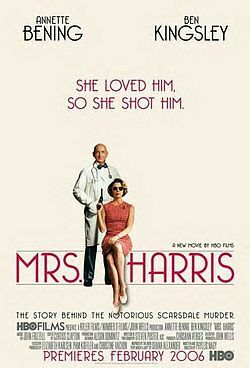 While not directly based on the Jean Harris case, it bears striking resemblances: the older wife abandoned for a younger woman; she apparently commits the murder in a rage but tells changing and inconsistent versions of the event while professing great affection for the dead man--even though her motive is clearly also mercenary.